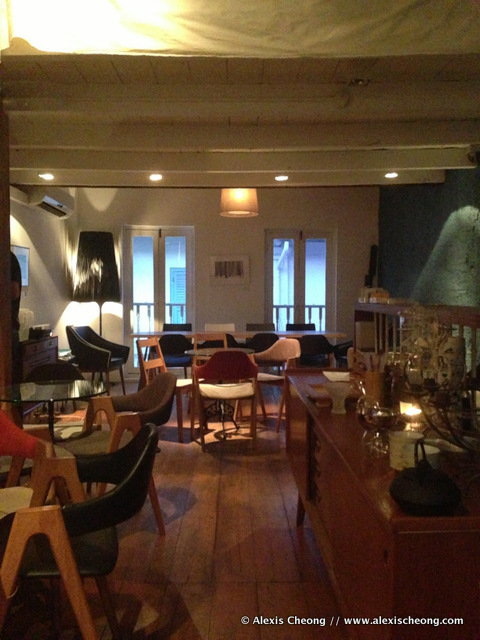 Or rather, the bar where a drink was named after me. Yes, that's right. You can now walk into Bar Stories and order an Alexis. It will be the best drink you've ever tasted. Trust me. Want to hear how that happened? Read on! I was at Bar Stories on Thursday night with colleagues - and we were all asked about what we would like in terms of a drink. How Bar Stories works is there are no cocktail menus - you tell them what you want and they'll make it for you. 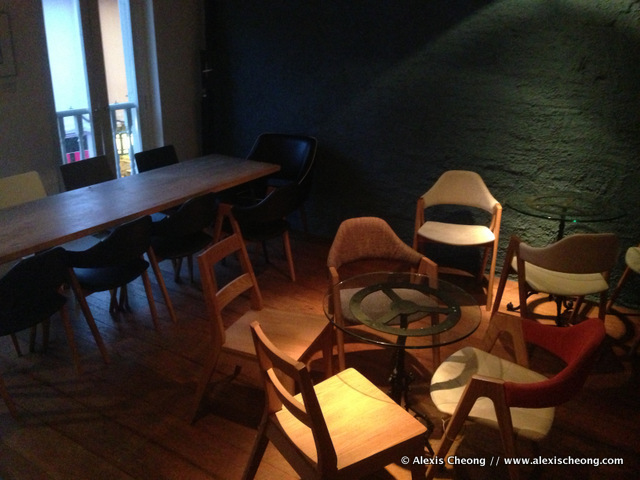 The place itself is really cool - tucked away in the second storey of a shophouse Haji Lane, filled with vintage and designer furniture (I want all their chairs!). So my colleagues ordered a drink that tasted like childhood (it came with a grape and a burnt sprig), a drink with yuzu in it (that's the one with green sprouts and a cup with salt that you can tip), a strawberry drink and a mojito. When it came to my turn I asked for something fruity.. either lychee or mango, and I don't like the taste of alcohol. The friendly waitress said the best cocktails in the world do not taste like alcohol, then asked if a Lychee Rose drink is alright. Sure, I said. We also ordered some dinner. 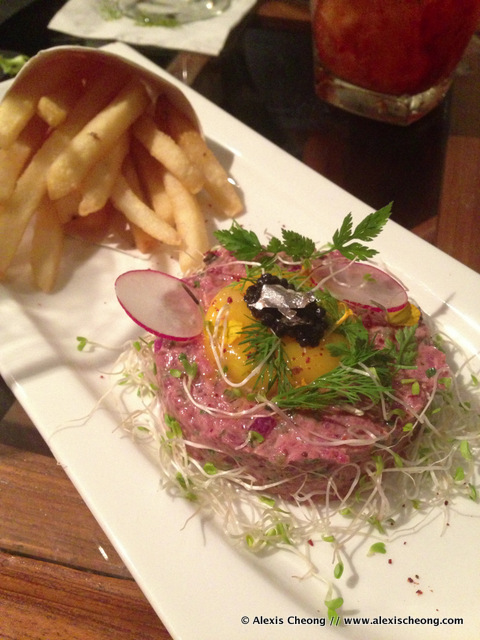 I had a beef tartare ($19) which looked cooler than it tasted, as the beef was not exactly the freshest. Points for the silver foil and caviar though! The rest ordered crostinis which looks quite good as well. 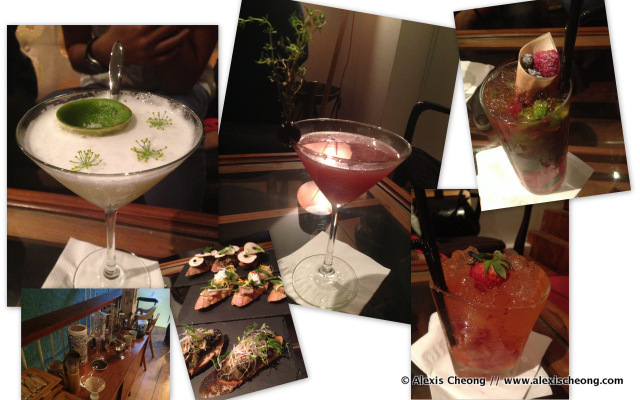 Drinks were served - and here's how my Lychee Rose concoction looked. So pretty! It was also very delicious. The foam's made of egg white (they usually are), and that sits on top of a tangy and sour lychee juice with gin base, that had a touch of rose aftertaste. It's not sweet at all, but more like a lychee rose lemonade. 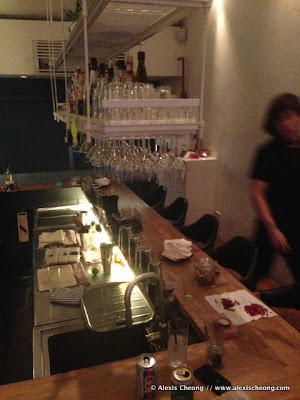 So the story was we were grilling the kind staff on what each of the drinks were made from, and what their names were. 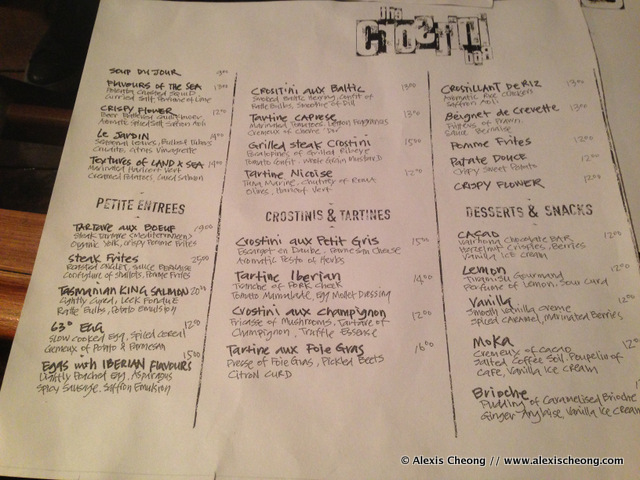 When it came to the lychee rose, he was said it was quite a new drink so they don't really have a name for it. Of course I had to immediately ask if they can name it the Alexis. Sure, he said. They have many names for their many drinks, but sure. 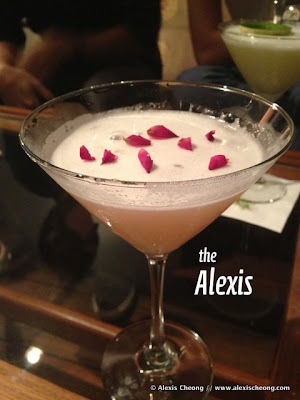 I then tried to affirm that should I visit the next time and order the Alexis, I'll get the lychee rose. He agreed. It was so delicious, I decided to order one more Alexis. Of course we thought it was a laugh, that it's just them humoring us. 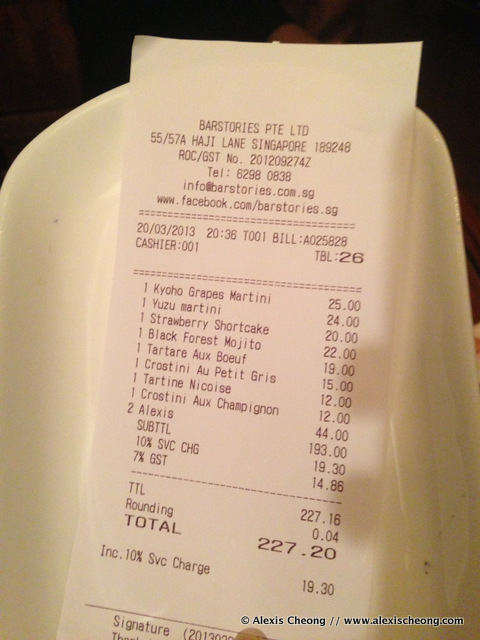 But the humoring got really cool when the bill arrived and we saw that they really billed the drink as the Alexis. Also, it's official if it's on paper guys. I've got a drink named after me, it's a great drink that's worth every cent ($22). You have to order it next time you visit!